One of the cool things about watching the Eugene Emeralds play every summer is that I get a sneak peek of what prospects might be playing at South Bend the following summer. Most of the players tend to be the most recent draft picks and that was the case last summer. One of them was first baseman Tyler Durna. 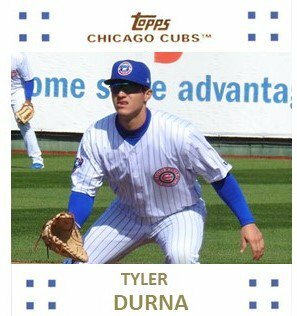 The Cubs selected Durna out of UC San Diego in the 15th around last summer. He played a little bit for Eugene before he was pretty much shut down the month of August. Heading into this season, I did not think much about him in terms of being in a lead bat in South Bend’s lineup. After two weeks, I’m pretty excited to watch him hit every game and every at bat. You have to cut me a little slack on this one as I focused in on Nico Horner in Eugene last summer and a few other prospects who had a little more shine. After watching Durna every day now, he’s pretty impressive. I had an inkling something might be happening with him back in the middle of March when Arizona Phil of The Cub Reporter talked about how good of a spring Durna was having and that he should be on the Myrtle Beach squad. Phil was disappointed when Durna was moved down, but Myrtle Beach’s loss is South Bend’s gain. What Durna can do is give an outstanding at bat every time up. He has a great knowledge of the strike zone and I love it when he chokes up with two strikes. He was hitting .326 before Wednesday’s game with an on base percentage of .354. His value as a run producer is easy to see as he’s posted a wRC+ of 130 in two weeks of action. He leads off this highlight below with his 2 strike approach. It is a thing of beauty. Durna is also an outstanding defender at first base. He’s got a pretty good floor but I’m not sure what his ceiling is going to be. In three years at UC San Diego, he only had 14 home runs. 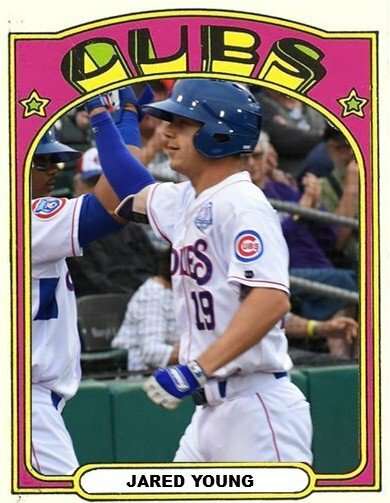 Home runs are hard to come by in April in the Midwest League, but I would expect to see Durna start to crank out a few. At 6 feet and 205 pounds, he’s close to being maxed out. But if you look at him, he carries that 205 pounds well and he might be able to add 10 pounds of muscle without it slowing him down. What is going to carry him forward in the organization is his bat and approach. The Cubs have shown time and time again that if a prospect can hit, they will find a place for him to play. Since he does throw left handed, it limits where he can go, but the bat should propel him through class A this summer. To be quite honest, he looks a little advanced for the Midwest League. Maybe after the draft, he’ll get bumped up to Myrtle Beach where he probably should’ve started the year. Today, I’m writing something different. While it’s technically not an all-star team, “The Hot Start Team” sounds more like a collection. It’ll be interesting to compare this team to the actual April All-Star team on May 1 and there could be several differences as other players will heat up and some of the players listed below will cool off. For the past 13 days, the players listed below are off to good starts for 2019. Some of the prospects are even dominating and could level up in May at some point. C – Ian Rice – He looked ready for AAA last year and he’s come out of the gate strong to begin 2019. He’s hitting .304 with a .346 OBP. 1B – PJ Higgins, Tyler Durna – Higgins also looks ready to start the year and he’s showing some pop along the way. As for Durna, I don’t see him playing for South Bend much longer. The bat is good, but the approach is even better. 2B – Levi Jordan, Carlos Sepulveda – Both of these guys are up there grinding out ABs and doing anything they can to help their team win. It could be a single, going the other way, or laying down a bunt or making a productive out. SS – Dixon Machado, Zack Short – Short’s misfortune of breaking a finger saddens me as he was hitting almost .400. As for Machado, he’s taken advantage of the situation and is pummeling the ball all over the field. I don’t have any word on when Short will return. 3B – Fidel Mejia – The 20-year-old switch hitter was rolling along before sliding into second base awkwardly and injuring his hand/wrist. OF – Nelson Velazquez, Jonathan Sierra, Trent Giambrone – The fact that two of these guys play for South Bend should get your juices going as both are showing great plate discipline and approaches at a key point in their development. The power will come, but maybe not until June when it gets a little warmer. Trent Giambrone is hitting above his normal mid 260-270s average at .300 with five dingers. His wRC+ is looking good at 152. 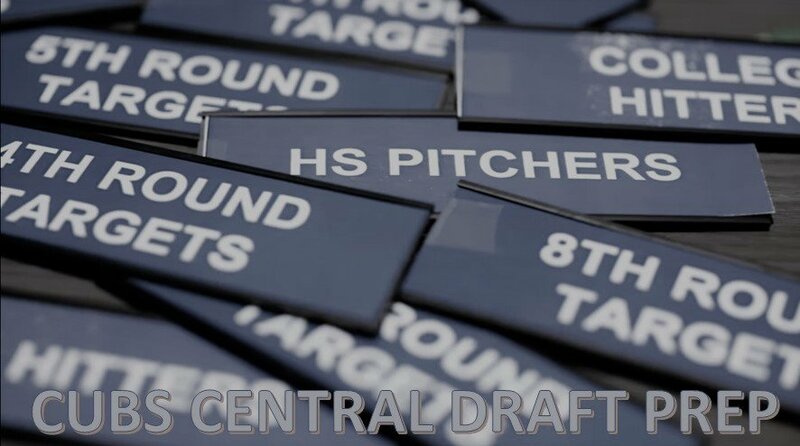 SP – Trevor Clifton, Keegan Thompson, Tyson Miller, Cory Abbott, Justin Steele, Cam Sanders, Brailyn Marquez, Riley Thompson, Paul Richan – Starting pitching is the strength of the system and for these arms, they’ve all dominated their so far in April. I really like what all the AA guys are doing night in and night out. Riley Thompson and Cam Sanders hold promise but there are still warts they have to smooth out. As for Marquez, his fastball looks electric every outing. 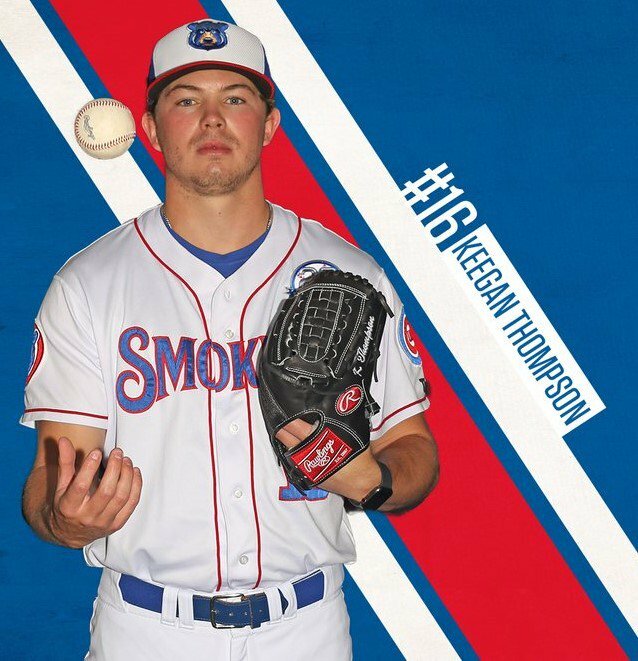 As for Keegan Thompson, he made one 5 inning no hit start and went on the 7 day IL. He’s scheduled to come off that tomorrow. The big surprise for me here is Hecht. I didn’t see him as a back end guy just yet. He’s doing great for Myrtle Beach in that role as he has really stepped up his command. Good for him! As for Mort and Passantino, they have been lights out and shut down arms as piggyback starters at South Bend. Who Is Missing from the List That Could Be on the Monthly All-Star Team in 2 Weeks? Jared Young is hitting dingers at a decent clip, the rest of his hitting game is coming along slowly. His average (.256) and OBP (.289) are slowly climbing. He also has 2 outfield assists! Nico is not hitting as well as we thought he would. He’s having good ABs, the balls were not finding holes. But he is walking at a higher clip than last year and that bodes well for his approach. On Monday night, he went 3/4 to push his average over .300. With half a month to go, that’s a lot of baseball left to play and a lot of stats to accumulate. When this list began today’s list, I only had two pitchers – Jack Leiter and Hunter Barco. That’s it. Both have seen their stock rise, fall, and now rise again. Most of the top prep arms will go quick, no matter the risk. However, I found a few arms who could be around at #27 including two from the same high school team. When MLB Pipeline first came out with their Top 50 Draft list, Jack Leiter was sitting pretty at #20. With a low 90s sinker and a plus curve with spin rates approaching 2500, he was seen as a very polished arm with some good lineage. For Leiter, he began sinking on most draft lists because he comes from a northern state. Now that he’s playing, he’s moving back up the draft boards. The Cubs could get a steal if he’s a guy they like at #27. He has USA Baseball experience. While he is not a 5 star athlete and doesn’t hit 99 on the gun, he is getting passed by. That might be a big mistake. Leiter has a solid four-pitch mix and knows what to do with all of his offerings. His fastball was in the 90-95 mph range all summer, touching those upper numbers in shorter stints and sitting around 92 mph more often than not. The fastball plays up because he throws it with some sink and commands it extremely well. Some feel his curveball is better than his slider, but both should be distinct and effective breaking balls for him, and he has a solid changeup as well. Here is Pipeline’s latest video with Jonathan Mayo adding commentary. Considering Leiter’s pedigree (Father=Al Leiter), Jack should be in the discussion for #27. The problem is he back rising up the boards. As for Hunter Barco…If one was to project where Barco could be in three years, most crystal balls would have him in the top 10 in the draft. The 6’4” lefty has USA Baseball experience and is committed to the University of Florida. Some scouts love Barco’s low arm slot as they see it as deceptive. Others see that same slot as to why he might have command issues. With a low 90s fastball and a decent slider, Barco needs to continue to develop a third pitch, which right now is a changeup. Two names to keep an eye for are teammates Matthew Thompson and J.J. Goss from Cypress Ranch, Texas. Thompson’s readings vary on his fastball. Some say he throws 91-93 while others say he is in the mid 90s. To be totally honest, though, Thompson’s out pitch is a wipeout slider. He also is developing a curve. He’s kind of a new arm who broke onto the scene in 2018. At 6’2” and 184 lbs., he carries that weight well and could probably add 15 pounds easily. In the video, you’ll see the giddy-up on his fastball and the inconsistent fastball command. J.J. Goss seems to be catching up to his teammate. While both are committed to Texas A&M, Goss is more of the ascending arm right now. His floor is a little bit higher than Thompson’s just based on command and an uptick into the mid 90s on his fastball. He’s got some nice movement on his heater but he’s also got a little bit effort to his delivery. Fellow Texan Josh Wolf is taking advantage of playing earlier in the year than his northern counterparts. He’s more of a project. In the video below from 2018, he was seen throwing upper 80s and low 90s. Well, like a lot of young arms, his stuff has ticked up this spring. At 6’2” and 165 pounds, he’s got a nice sized frame to fill out and see his stuff tick up even more. He might be a bit of a project. Then again, what high school arm isn’t. More than likely, he could be sitting there in the second round as well as the first. Out of all the categories, this one has the highest level of risk. It is also the hardest category to project and the Cubs have have not had good luck with high school arms. Only Justin Steele has had some level of success. This year, I don’t see the Cubs going with a prep arm in the first round. However, the second or third rounds might be more plausible and much less of a risk than at #27. Then again, Barco and Leiter would be pretty tempting if they are still on the board. 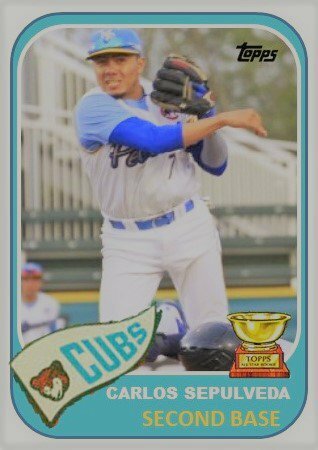 It’s only been 11 days, but one of the best stories percolating about a Cubs prospect this year is the return of Carlos Sepulveda after missing most of the past two years with a shoulder issue. Now at 22, the young second baseman took a few games this year to find his feet before he began to take off for Myrtle Beach. 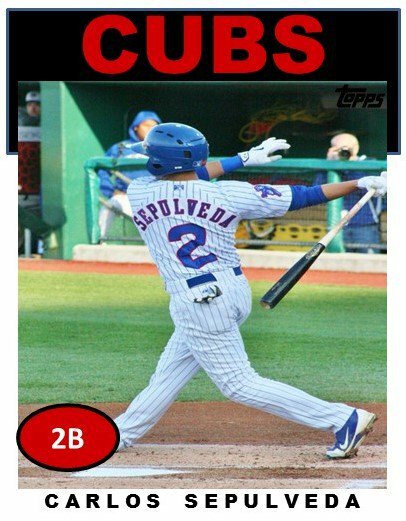 Sepulveda was one of the first wave of players the Cubs signed from Mexico in 2014. 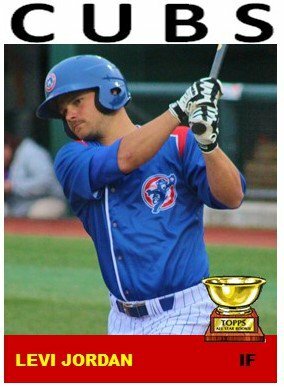 He broke out on the scene in 2015 in Mesa and his name begin to grow a bit before the 2016 season when Keith Law put him on his Cubs top prospect list. 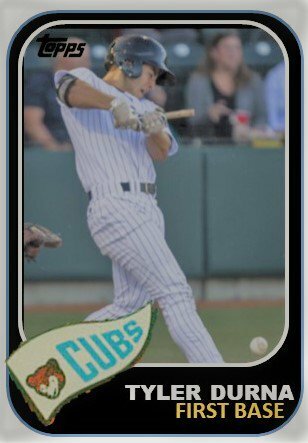 After skipping Eugene, Sepulveda showed a great eye at the plate and the ability to hit the ball on a consistent basis for South Bend. 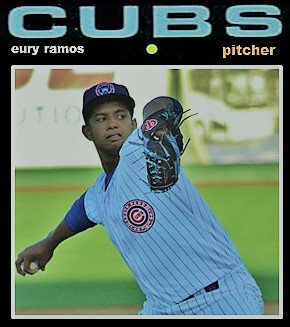 At just 19 years old, the young lefty squared the ball up constantly for the young Cubs team. For the season, he hit .310 with a .366 OBP and a wRC+ of 122. I like his quick bat and his ability to hit lefties and righties equally. His stance is a little open which one would think that would make him somewhat pull happy, but he used the opposite field 37.6% of the time in 2016 and is at 52% for this season. Here’s some video of him in action via 2080 Baseball. MLB Pipeline said the following about his future heading into 2017. 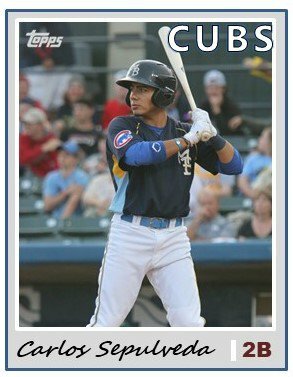 Sepulveda’s hands work at the plate and in the field as well as those of any Cubs prospect. With his hand-eye coordination and easy left-handed swing, he repeatedly strokes line drives from gap to gap. He’s not physical and won’t hit for a lot of power, though he does have some sneaky pop to his pull side. Sepulveda profiles best at second base, where he has exceptional polish for a teenager. For 2017, he was promoted to Myrtle Beach. He began the season and you could tell right away that something wasn’t right. After about a month, Sepulveda was put on the disabled list and spent May through July trying to get his shoulder fixed. He showed back up in Mesa in August and was part of the 2017 Arizona Rookie League championship team. At that time, the thought was he would be back to redo Myrtle Beach in 2018. That didn’t happen as he missed all of 2018, too. It would not have surprised me to see Sepulveda come out a little bit rusty to begin this year. And he did for just a few games (1/7). Even though the hits were not falling the first weekend, I noticed that he was hitting the ball with authority. It just happened to be right at somebody. This last week the hits began falling for him. For the week, he went 6/21 or .285. I really like what he can do to a baseball. He’s not going to hit for a lot of power but he can drive the ball either in the gap or down the line. He is going to put the ball in play consistently. In spite of missing the better part of two years, Sepulveda is still only 22 years old. It would not surprise me in the slightest to see him get a call to Tennessee at some point in the summer. In order for that to happen, though, he is going to need to continue to hit the ball with authority, spread it all over the field, and, most importantly, stay healthy. Jen-Ho Tseng was released from the 40 man roster to make room for Alan Webster on the 25 man roster. The Cubs could technically re-sign Tseng as of yesterday. He could not be on the 40 man roster for 30 days if he does re-sign according to Arizona Phil. The Cubs’ system also saw a plethora of injuries that required a little roster tweaking throughout the week. 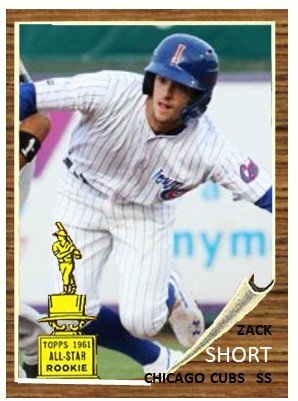 Zack Short looks to have a broken finger but we haven’t heard how severe it is or how much time he will miss. As a result, Vimael Machin moved from Tennessee to Iowa and Clayton Daniel took his spot for the Smokies and went three for four in his AA debut. 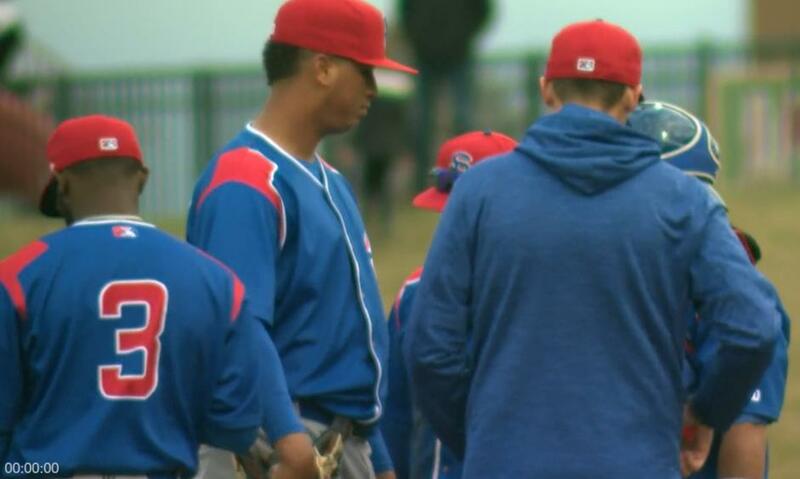 Alberto Baldonado also debuted this week for Iowa and Zach Hedges is back on the Smokies roster replacing Keegan Thompson who went on the IL on Thursday. Both Brad Markey and Ryan Williams came up and pitched for Iowa. Markey was then shipped to Tennessee and Williams was put back on the 7 day IL for Iowa. At South Bend, third baseman Fidel Mejia injured his wrist/hand sliding into second base. SS/3B Christopher Morel came up from extended spring training on Friday and tripled in his debut game. Usually, I get emails alerts from the team when roster changes happen, but I am still in “school mode” for 6 more weeks. I just need to check my email more often throughout the day. I am very much looking forward to being in “summer mode” to keep on top of the daily minutiae as they transpire. Iowa (6-3) Weather hampered the Cubs from playing much this week. Cold and rain shut them down for two days at home. Carl Edwards has been lights out in his return. I don’t expect him to be down much longer. 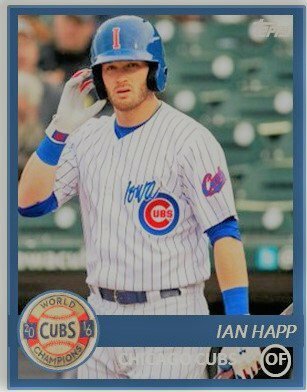 Ian Happ could take a while to get straightened out. Happ’s OBP heading into Saturday night was just .273. Tennessee (5-3) After a scheduled day off and a rainout the Smokies got back at it this week. Yesterday, I wrote about how the Smokies look to be the team to watch this year. Myrtle Beach (2-8) The Birds won their second game of the year on Friday as they were able to coax 11 walks. Paul Richan also continues to do well on the mound. He’s given up 1 run in 2 starts. Hopefully, he can improve on his efficiency and get to the sixth inning soon. South Bend (5-5) The bats look like they might be starting to warm up after a frigid first few games in South Bend and Grand Rapids. The bullpen has blown a couple leads this year, but it is early. Part of the issue is that not everybody is fully stretched out and the piggyback starters are having to go a little longer than usual. It will work itself out here soon. Leaders in wRC+ for each team – I love this stat as it measures offensive production against the norm. An average player would be given a score of 100 and 115 would be above average Above 140 is labeled great while 160 is considered excellent. Heading into Saturday, utility infielder Levi Jordan had a 180 for South Bend while 2B Carlos Sepulveda lead Myrtle Beach with a 90. PJ Higgins lead all active Smokies position players with a 210 and SS Dixon Machado of Iowa lead the whole system at 275. Most of those numbers are not sustainable except for Sepulveda’s, which is on the rise as he warms up. This week, major-league baseball announced the international free agent bonus pools for each team. The Cubs came in with $5,398,300 which is close to their draft pool of $5.8 million. In addition, Baseball America wrote a nice article on some sleeper prospects from last year‘s international draft class. 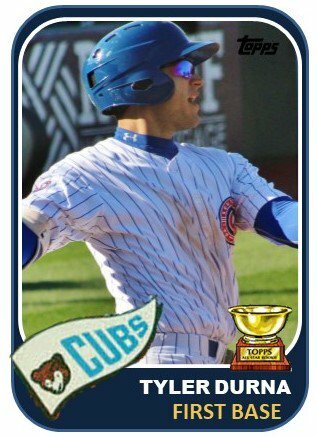 Cubs’ prospect outfielder Yohendrick Pinango was given a nice write up. More than likely, he’ll be in the Dominican this summer. Don’t forget the Cubs still have some international bonus pool money left over that they got in the Pedro Araujo deal that they have to spend by mid June. Tomorrow, Myrtle Beach’s Carlos Sepulveda gets an update. 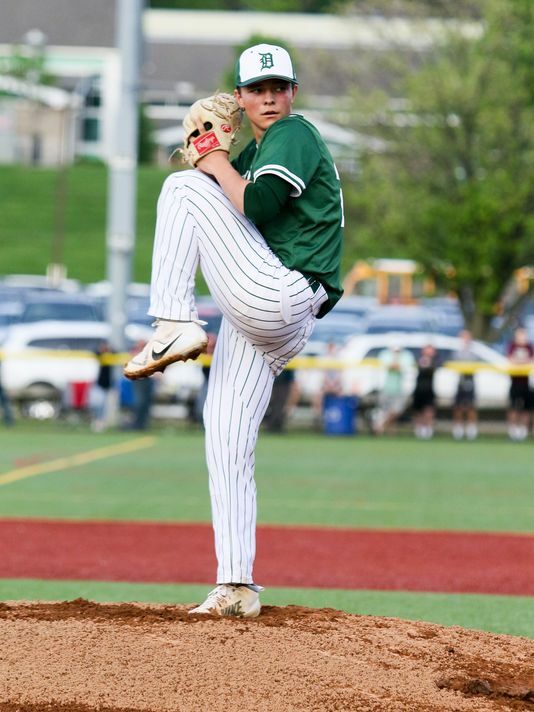 On Tuesday, I will take a look at high school pitchers in anticipation of this year’s draft, which is seven weeks from tomorrow. The Midweek Report on Wednesday will produce the “Hot Start Team” while later in the week I will have a draft profile on either Parker Mitchell or Dante Biasi. I am also thinking of doing a weekly Saturday post that looks at just one affiliate. I love the light and shadows set against the outfield wall in the background in this 1971 frame. With every game, it’s looking more and more like Tennessee is going to be the Cubs affiliate to watch in the first half. 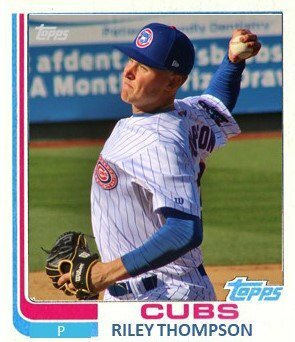 While the star power of Ian Happ and Carl Edwards, Jr. is currently at Iowa, the Smokies look to have the most solid ball club. While not every one is clicking on all cylinders, the 5-2 Smokies clearly have a lot of things going in the right direction. 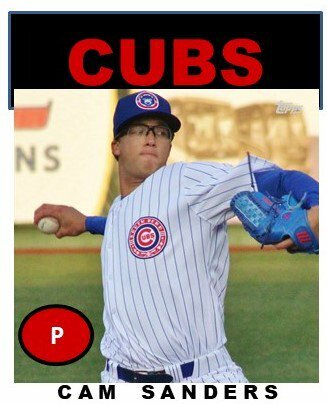 Starting Pitching – From starter #1 to starter #5, the Smokies clearly have the deepest rotation in the Cubs’ system. Keegan Thompson threw five no-hit innings in his first start with 8 Ks while Thomas Hatch has pitched ten scoreless and struck out eleven in two starts. Last night, Cory Abbott went 5.2 IP with 8 Ks while allowing one. On Wednesday, Tyson Miller went five innings and struck out six while only giving up one hit. Justin Steele has the highest starter’s ERA at a measly 2..45. It’s fun to watch them go at it each game. Every night looks to be must see TV on the mound. Hitting – Right now, returning Smokies PJ Higgins Charcer Burks, and Ian Rice are holding their own to begin the year. Newcomers Nico Hoerner, Jared Young, and Jhonny Pereda are still finding their feet although Young has 3 system leading dingers. Still, all three are able to contribute along with Christian Donahue. The Bullpen – This portion of the squad is still trying to find their lanes, but Craig Brooks, Bailey Clark, and Ian Clarkin seem to be doing fine at the backend of the bullpen. Last night Wyatt Short got it going with 2.1 scoreless frames. For manager Jimmy Gonzalez, this year has to be a dream. He coached most of these players in the last three years. His familiarity in dealing with the squad should only help as time goes on. The HD – Watching the Smokies this year has been a special treat. It’s been an inside joke among many about how hard it’s been to watch the feet of the Smokies the past few years. This year, though, new high definition cameras have changed everything about the action. While it is always been great to listen to broadcaster Mick Gillispie, now fans can see the action that is going along with his story. 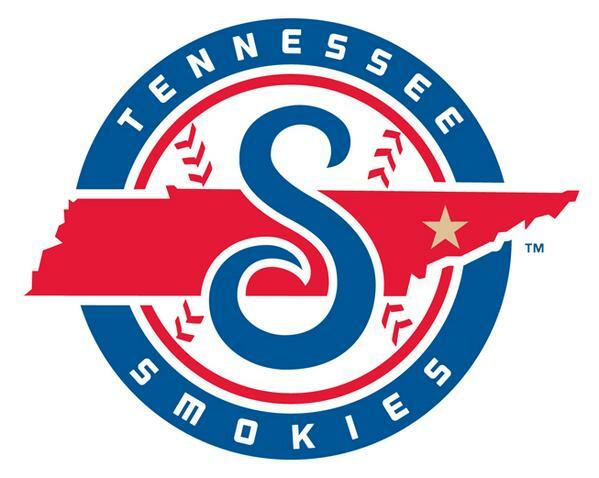 The Fast Start – The Smokies played the White Sox and Braves’ farm teams during the past week. Both of those squads are prospect heavy and each team has some of the top prospects in their respective organizations. The fast start should continue as long as the starting rotation stays healthy. With the logjam in the Cubs system, I don’t see any big moves to AAA in the near future unless there is an injury. Come the end of May, all bets are off for both pitchers and hitters. We could see a few moves, especially if some of these starting and bullpen arms continue to dominate at this level. Judging players in April is never a good thing. Consider the fact that the South Bend Cubs have been playing the last 4 games in frigid temps in the 30s and 40s. No one here at Cubs Central is going to look down on those hitters or pitchers for not producing in conditions many are experiencing for the first time. It will get warmer. Still, some interesting trends are out there that bear watching. Yeah, this is not good. The bats are not working and, as my friend John says, “only 3 guys are hitting their weight.” I do like that Bryan Hudson has looked good and Kevonte Mitchell is kind of clicking. As well, reliever Garrett Kelly joined the team on Thursday. I love his arsenal. He threw two scoreless frames last night. Andy Weber is well under .200 but I don’t expect him there forever. He will make adjustments and put it together. The same is true for a lot of bats on both class A teams. Tennessee’s starting staff is killing it. Keegan Thompson and Thomas Hatch have both thrown 5 inning no-hitters. Meanwhile, Justin Steele has the highest ERA there at 2.45. Zack Short and Fidel Mejia both got off to scalding starts that came to screeching halts with finger and wrist injuries respectively. Add in Victor Caratini’s injury and we could see some catchers move up today or tomorrow. Taylor Davis will join the big league club while PJ Higgins or Ian Rice could end up in Iowa. The class A guys will stay put. It’s just 8 days, but PJ Higgins, Ian Rice, Dixon Machado, Brailyn Marquez, Thomas Hatch, and Keegan Thompson were all overpowering the first week. When I watched Marquez pitch, though, I think I was drooling the whole time as his fastball was unhittable in the zone. These are just some interesting trends that we should keep an eye on. Their stats could mean something, or they could not.